Summer is coming to an end here down under. I have mixed feelings about summer, it gets a little too humid sometimes, my wardrobe has is a little biased (I own more winter clothing), my makeup slides a little more and a lot of money goes to investing in good sunscreens. However I do enjoy a bit of sun and the beach and summer is also appropriate for warmer orangey blush and lips that I adore. Mecca Cosmetica To Save Face SPF30 - It took me a while to find a good non greasy facial sunscreen that behaves well under my foundation. This is THE ONE. Aesop Protective Body Lotion SPF50 - Smells fresh and non greasy, this is my kind of body sunscreen. 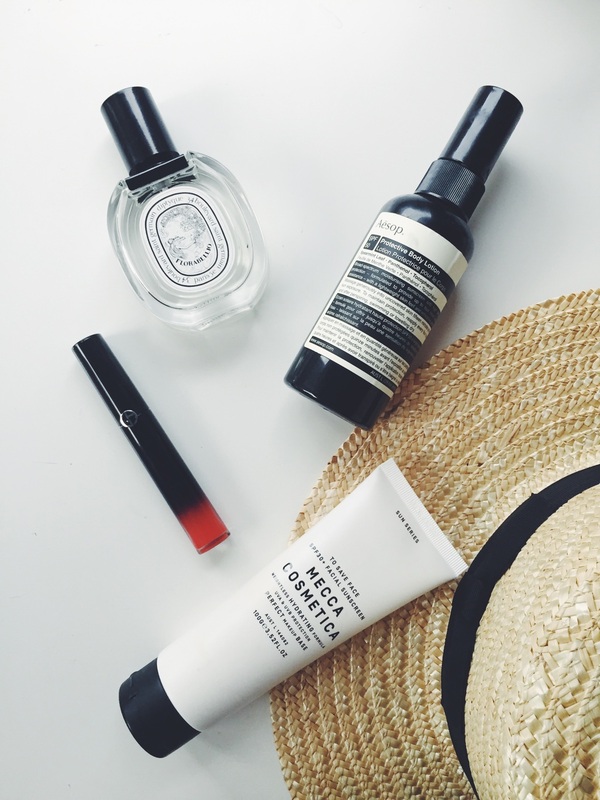 Diptyque Florabellio - My go-to scent this summer. Light, fresh, sweet but not too floral. Nature Republic Aloe Vera Body Cream* - I tried my best to avoid sunburnt but somehow I managed to get burnt on random spots. This is very good and affordable after sun care! Mizon Water Volume Aqua Gel Cream* - A lightweight and cooling face gel. Perfect for really humid days or after sun. Good for oily skin and sensitive skin. Sachajuan Hair After The Sun - I enjoy this après sun leave-in conditioner, light, non greasy and the scent is subtle. Go To Skincare Exfoliating Swipeys - These delicious citrusy scented wipes are easy to use.I love the grittier side of the pads. I use this every other day after cleansing at night. I also swipe this on my neck and the back of my hands.